Today's TOI announced that 'Cambride launches study of ancient India'. They call the study linguistic archeology...expected to unearth greater knowledge of India's ancient intellectual and religious traditions. The oldest dated and illustrated manuscript known, 10th century Buddhist in Sanskrit, was discovered by chance in 1883 in an unused temple! To quote: "One reason this collection is so important is because of the age of many of the manuscripts. In the heat and humidity of India, materials deteriorate quickly and manuscripts needed to be copied again and again. As a result, many of the early Indian texts no longer exist." It surely is a miracle that Mahabharata survived. Just imagine the work involved in copying this epic. Thousands of palm leaves would have to be prepared and used. Copy right has a different meaning here! More about palm leaf manuscripts from another blogger. "The scribe, usually a monk or a scholar, uses a stylus for writing. The scribe places the leaf strip on the palm of hand, as it is easier to gauge the pressure needed for writing. The letters are written from left to right and the scribe uses the parallel lines of the veins of the leaf to guide him to write straight." "The letters etched with the stylus are colourless and therefore difficult to read. So it has to be ‘inked’ in a special manner. ... Leaf surface is rubbed with a wad of soft cotton cloth dipped in the resinous oil and ... with charcoal. ... 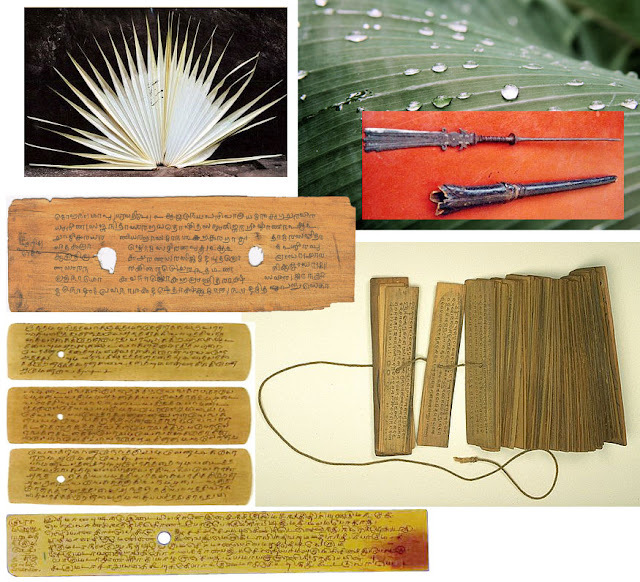 The letters on the palm leaf then appears dark black and the words are distinct and easy to read." There is much more to palm leaf making (linked here), selection of the leaves, preparation, preservation and so on. It is quite an effort and would have been a cottage industry if the demand was high! Just to imagine the size of Mahabharata itself is exciting. I guess that two slokas per page would mean 50,000 pages, assuming that it is written on one side. If 500 pages are made into one volume, there will be 100 volumes in all. If we fit in 4 volumes in the length of present day book, it will mean 25 books in all. It will be 13 volumes if the writing is on both sides of the palm leaf. The Critical Edition was collated from 1,259 manuscripts. This edition in 19 volumes (more than 15000 demi-quarto size pages) comprised the critically constituted text of the 18 Parvas of the Mahabharata consisting of more than 89000 verses, an elaborate Critical Apparatus and a Prolegomena on the material and methodology (volume I), written by V.S. Sukhtankar. As I try to narrate the story with the help of different versions, I see significant differences in their treatment of the same incident. While Kamala narrates the fun Pandavas had at the discomfiture of Duryodhana. She also gives us an insight into the personalities of both Yudhisthira and Duryodhana. These dire predictions by Vyasa and the statement that fate cannot be understood or altered sinks Yudhisthira into depths of despair. He unable to think and unable to speak to anyone about it. Duryodhana returns to Hastinapura. His heart was near the point of breaking. He would not talk to anyone. He sat alone and thought of the way he had been treated by providence. 'Pandavas are favoured by gods....they were dismissed to a barren strip of land....they have now become the masters of the world'. Thoughts like this were chasing each other in his mind. He sat alone hugging grief to his heart. The childhood jealousy had turned to hatred and now was an obsession with him. Unlike his father who was a coward and could cover his thoughts with a cloak of hypocrisy, Duryodhana who hated hypocrisy was frank and revelled in speaking his mind. He was a Noble prince and people liked him and were happy with his thirteen years of rule. But he was cursed with one tragic flaw: ENVY. This one fault led to his fall. If it had not been for this, Duryodhana would have been great indeed. If we translate this envy to our golf game may be we can bring the handi cap to respectable level!